Welcome to Berry Go Round #35, a blog carnival devoted to outstanding posts about plants. If you missed the last edition at Watching the World Wake Up, you can find it here, and I promise you it’s worth the trip. December, the last month of the year on the Gregorian calendar, is marked by, in order, Hanukkah (which may begin in late November), the Winter Solstice in the Northern Hemisphere, Christmas, and Kwanzaa. For most Westerners, though, the most conspicuous celebration is that of Christmas, and several plants are associated with it, even if they were carried over from earlier traditions. This edition, therefore, presents a feast of bloggers looking at Christmas plants. Plus, I have a couple of surprises for you: 1) a group of organisms that don’t necessarily jump to the forefront of your mind when you think of Christmas, and 2) the absence of any good blog posts this month on a very beautiful Christmas plant. And finally, there were plant posts out there unrelated to Christmas but so worthwhile that you’ll find them here, too. When I was growing up in rural southwestern Missouri, no one in our (very small) town ever bought a Christmas tree. We all knew someone who was happy to have a few small “cedar” trees thinned out of their woods at that time of year. It wasn’t until years later that I learned the trees we had cut down were not cedar but Juniperus virginiana, also known as Eastern Red-cedar. 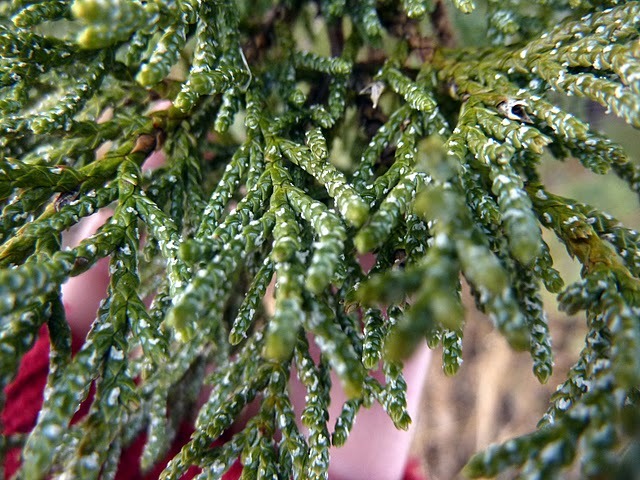 Juniperus virginiana doesn’t make it much further west than where we were, but the alligator juniper (Juniperus deppeana) is found out there, in five different varieties. Sarcozona at Gravity’s Rainbow worked out which variety she was looking at on the spot, and she made it seem so easy! It’s not so common any more to see a juniper Christmas tree. “Real” Christmas trees are often sold as Scotch pine. You might think that that conifer was some kind of pine, wouldn’t you? Guess again. The Phytophactor straightens it all out in ‘Tis the Season Tree Identification. Ed Remsrola at The Amazing World of Conifers, though, has his own idea of what he thinks would be a nice Christmas tree. In Dear Santa… he describes three forms of Serbian spruce, Picea omorika, which he thinks would be perfect. Some people are able to cut down their own trees, and Jennifer Montero took her dog along to help, in Harvesting the Christmas Tree at milkweed & teasel. Nice countryside. Can you name that species? If not, maybe you’d find it in the book on Gymnosperms at Art Plantae reviewed by Phytophactor. How many parasites do you associate with Christmas? One? How about twelve? The “12 parasites of Christmas” at Parasite of the Day include plant parasites such as the fig wasp (figgy pudding, anyone?) and Nuytsia floribunda (a parasite known as the Australian Christmas tree). Then there’s the Christmas tree parasite you can eat, Sparassis crispa. But there are parasites of reindeer, too, and of rats from Christmas Island. There’s a post on how frankincense was burned to ward off malaria-bearing mosquitoes. Another on the parasites of turtle doves. 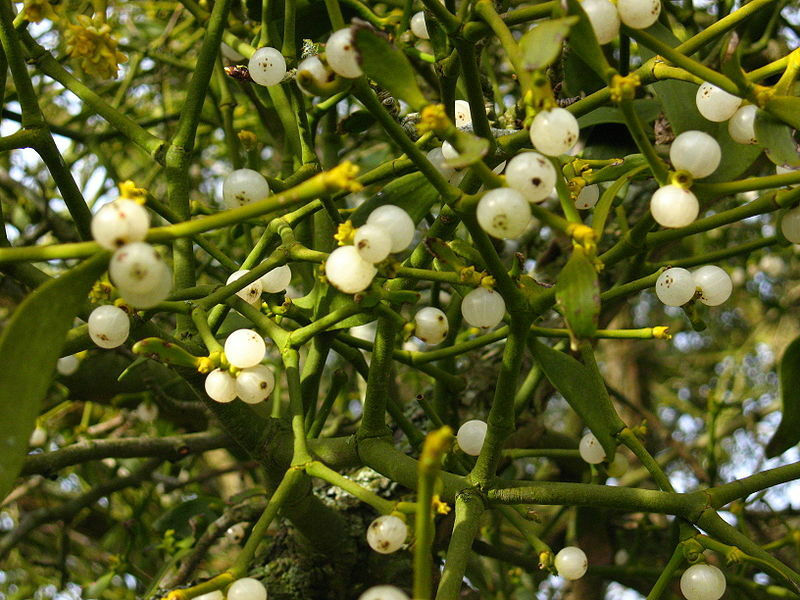 The most famous parasite associated with Christmas is the European mistletoe, Viscum album, which parasitizes more than 200 kinds of trees and shrubs, and which was originally thought to protect the home. It’s actually a hemiparasite, but go see for yourself at this excellent site. Maybe you’d like to grow your own mistletoe. If so, there are some tips at, appropriately enough, Gardeners’ Tips. Bear in mind, this blog originates in the UK. The mistletoes associated with Christmas are temperate climate parasites, but mistletoes occur in the tropics, too, as I was surprised to discover. Finally, there’s the s**t on a stick version of mistletoe at Swamp Things (not to give anything away, of course). Hat tip to Sally of Foothills Fancies for this one. Have you ever paid attention to the words in The Holly and the Ivy? Why is Ivy outside in the cold while Holly is making merry inside the hall? Sally at Foothills Fancies explains all and does more. She goes through the carol “Candlemas Eve,” a botanist’s delight, which mentions rosemary and bays, “mistletow,” box, yew, and many more. Sally pulls together the likely botanical names of the ones we might not know. An interesting and delightful post. Further, at Small Wonders, Sally ponders the wreaths and boughs mentioned in old carols in A Harvest for the Holly Days. 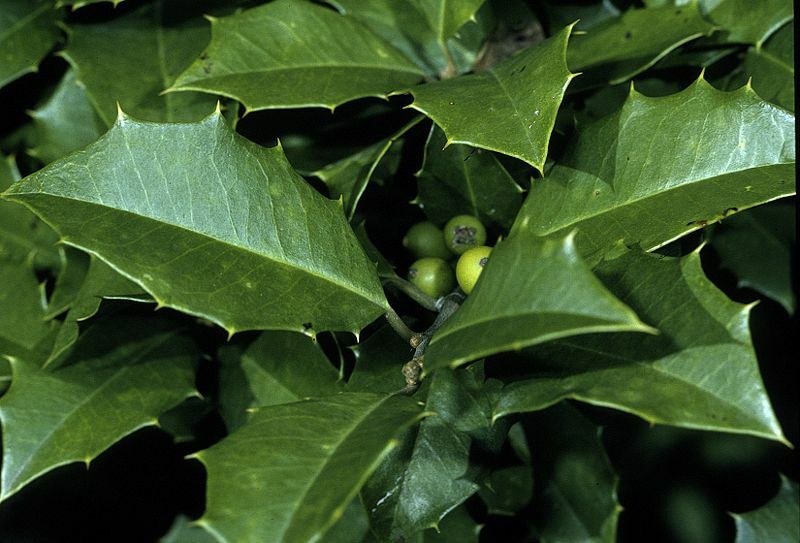 Boughs – not sprigs – of holly? And then there are the ground pines, clubmosses, once used for making wreaths. What happened to them? No decent blog post (that I could find – please excuse me if I missed it and you wrote it) on the Poinsettia this year! Now . . . is this the first time you’ve ever seen the absence of a post featured? Update: How could I have missed it? 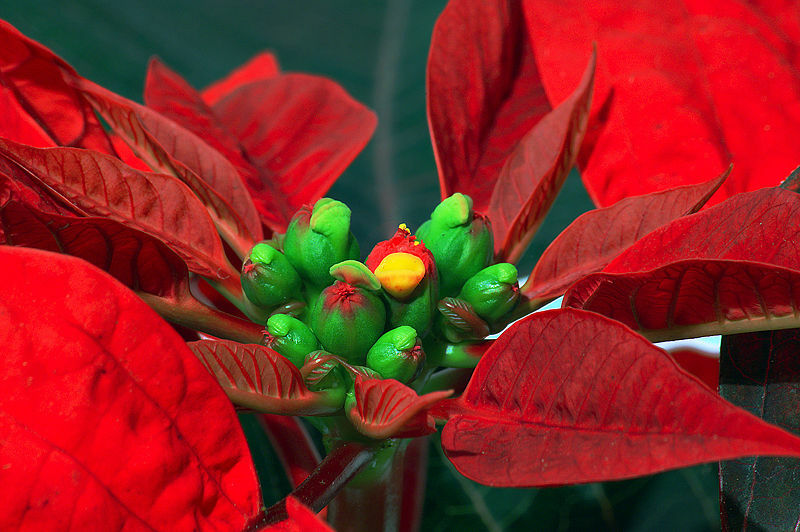 Botany Photo of the Day featured the poinsettia, Euphorbia pulcherrima, on December 24, 2010. (Thanks, Sally!) Further, there were two posts out there on the related Euphorbia aphylla, commonly known as the “candelabra cactus.” See Sarcozona’s comment below and her post at Gravity’s Rainbow. And see Christmas Tree Nostalgia at The Phytophactor. The Yucca and its Moth at The Prairie Ecologist. You may very well know that the yucca plant has a fantastic relationship with its own moth, but even if you do, the nice overview and great photos are worth looking at. In addition, the post points to a couple of papers that go into greater detail. Well worth reading. The world is warming up (and huge snowfalls in parts of the US and Europe are the results of that, not despite it). Luigi at Agricultural Biodiversity Weblog reveals the not pretty predictions for a 4 degrees C warmer world and what it will mean in particular for African agriculture – maize down by 19%, beans down by 47%, for instance. But there are some ideas about what to do – a nice change from hand-wringing. With a little investigation, Mike at Slugyard finds that the maple-like shoot rising from the fallen leaves has, despite its spikes, some beneficial properties in The Not So-Evil Plant. Finally, could you make a musical instrument out of a carrot? An entire orchestra of instruments from various vegetables? No carols, but for year-round entertainment here are the Musical Vegs… from Laurent Penet at Seeds Aside. That wraps it up for Berry Go Round #35. Look for the next edition to be announced at the Berry Go Round blog. If you have something you’d like to submit or if you’d like to host a carnival edition, you’ll find the guidelines here. And a Happy 2011 to all! Masterful work, Mary, as always, you provide such an interesting assortment. Thanks for including my posts; I can’t wait to explore the others. Thanks, Sally. Your posts added a good deal of richness to the mix, and I was very glad to include them. Thanks, Mary – lots of interesting posts to look at! Thanks for the comment. I had a good time rounding these up, and I trust other people will enjoy reading them, too. Will we see one of your Friday Flowers next time, I hope, I hope? There may not have been any poinsettia posts, but I got close with my Christmas tree, Euphorbia aphylla, which is a congener. So many good posts in such a good narrative – I’m afraid I’m going to spend my morning reading all these posts instead of writing about that mistletoe and juniper!